Can You Ever Achieve Total Security Traveling or at Home? What Are the Risks? Last week, someone asked me whether I thought it was safe to travel to Izmir, Turkey. Thanks to my line of work, these kinds of questions no longer surprise me. People have been asking me such things for almost as long as I can remember. And since I have gained visibility through my work as Stratfor’s lead terrorism and security analyst and as the author of a book on travel security, the inquiries have become only more frequent. Most of the time, I don’t mind offering travel security advice. By Dave Grossman’s model of human nature, I am a sheepdog-type person (as opposed to a sheep or wolf), naturally predisposed to protect people. Moreover, I appreciate people’s efforts to understand the environment they are going to visit. After all, foreknowledge goes a long way toward avoiding unpleasant surprises. But I suspect that my responses to these kinds of questions often surprise the people asking, especially those who seem to just want an empty reassurance that their trip will be a safe one. This is because in reality, no place is truly safe from every possible threat; the idea of total security is a myth. Risk is inherent in every single thing we do — or don’t do. I incurred a risk when I got out of bed this morning, another when I exercised and countless more during my commute. Although obviously some activities are riskier than others, none of our actions are completely risk-free. Even if I were to live isolated in a hermetically sealed bubble, there would still be risks to my health (and sanity). And, of course, the same goes for travel. Rather than give a patent yes or no ruling on the safety of a particular trip, such as the trip to Izmir, I prefer to outline the various dangers that lurk in a given locale and help prospective travelers to contextualize them. In fact, the article I wrote a few weeks ago describing the diverse terrorist threats in Turkey adapted some of the information I have supplied the many other people to ask me about traveling to Turkey in the past couple months. Some, but not all. People tend to fixate on the highly publicized terrorist threat that groups such as the Kurdistan Workers’ Party, the Kurdistan Freedom Falcons and the Islamic State pose in Turkey. By its nature, with its spectacular, made-for-media events and the type of coverage it attracts, terrorism seems a far more common and deadly occurrence than it is. Indeed, terrorism-related deaths overshadow the larger number of deaths that result from other causes each year. 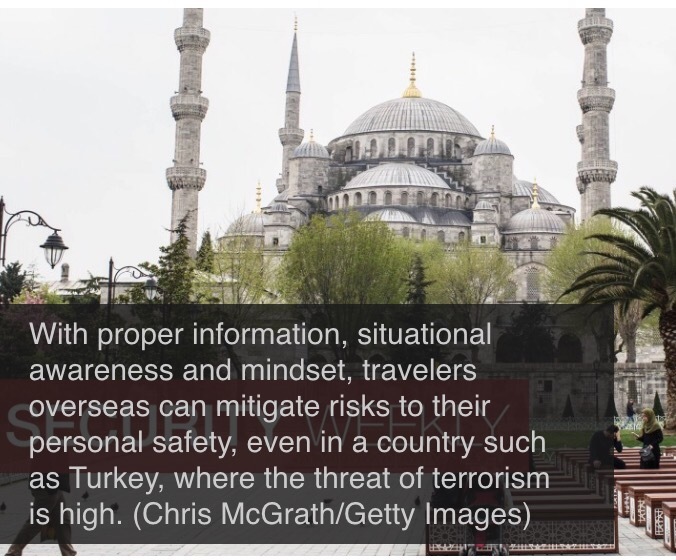 But in truth, other dangers present a far more likely risk to a traveler in Turkey than terrorism does. These include fires, natural disasters, accidents and disease. Now, this is usually where people roll their eyes, not considering fire or natural disaster to be a viable threat. But the numbers don’t lie: The World Health Organization estimates that 195,000 people die each year from fire. By contrast, figures from the U.S. Department of State’s global terrorism database indicate that from 2005-2014, only 17,615 have died from terrorism. Furthermore, some 228,000 people were killed on a single day from the massive earthquake and resulting tsunami that ripped through many parts of Asia on Dec. 26, 2004. Beyond natural disaster, statistics also suggest that far fewer people die from terrorism than from automobile accidents, criminal homicide or drowning. The U.S. Department of State’s Bureau of Consular Affairs broke down the causes of death for Americans traveling abroad, reflected in the graphic below. According to the data, Americans traveling overseas are over 10 times more likely to die in a transportation accident than in a terrorist attack. So terrorism is but one of the threats — and a statistically improbable one at that — that travelers must hazard if they wish to venture overseas. To travel safely abroad, myriad other potential threats must be understood and avoided. And many of these risks are not confined to overseas environments. According to data published by the Centers for Disease Control and Prevention, there were more than 130,000 accidental deaths (of which 33,000 were traffic accidents and 30,000 accidental falls) along with 16,000 homicide deaths in the United States in 2013. The same year saw 21 deaths by terrorism inside the United States. The bottom line is that there simply is no such thing as absolute safety and security. And since more people die from household accidents every year than from terrorism or criminal homicide, holing up inside your home is no guarantee of safety. With that cheerful reality in mind, are we supposed to curl up in a fetal position? No, because even that behavior bears risks! How then are we supposed to live in a world where absolute security is merely a myth at home, at work or on vacation? We must mindfully and intentionally face the risks. The first step in avoiding or mitigating the impact of potential threats is to be educated about them. People simply cannot account for what they do not perceive. Situational awareness can be a very useful tool in protecting people from any number of threats, from being hit by a car while crossing the street to suffering a criminal assault or terrorist attack. Though the risk of getting hit while crossing the street may seem laughable, it is a real problem. When I first moved to Australia, I had to make a conscious effort to look right and not left any time I crossed the street. Later, when I was an agent with the State Department, a colleague was struck crossing Virginia Avenue and went down hard on the pavement in a flurry of classified documents that he’d been carrying. Mindset is another important factor in dealing with risks, not only in overcoming denial that threats exist and supplying the basis for proper situational awareness but also in determining one’s sheer will to survive. Another crucial aspect of mindset is the willingness to modify behavior to reduce overall risk. Whether this means not going outside without mosquito repellant, not driving after dark or on certain roads, or not eating certain foods, the willingness to alter behavior to avoid or minimize risk can be a lifesaver. In December 2013, an American teacher working in Benghazi, Libya, was assassinated while running along the side of the road. Despite the demonstrably hostile environment in which he lived, he refused to give up running on the road. Of course, even in the United States he could have been struck by a vehicle and killed while running. But as an obvious Westerner in Benghazi, his running was much more dangerous. Simply put, some threats demand sacrifices to minimize risk. And this brings us back to the people who asked about their upcoming trip to Izmir. I didn’t tell them not to go. Instead, I informed them of the risks, advising them to keep a low profile, practice sound situational awareness and avoid tourist sites, Turkish government buildings and other likely targets for terrorist attack. Properly informed and prepared for the environment, they will assume yet another of life’s many risks and go on their trip, as planned. Though absolute security is a myth, not all risk is insurmountable. Previous post: Why Muslims, Pope Francis?